A. BrdU-labeled human lymphoma cells were stained with Mouse anti BrdU antibody, clone BU20a, (MCA2483) at a 1/100 dilution for 1 hour at room temperature. Goat anti Mouse IgG (H/L) DyLight® 649 conjugated (STAR117D649GA) was used as the secondary detection reagent at a 1/50 dilution. PUREBLU™ Hoechst 33342 (1351304) was used to stain total DNA. B. BrdU-labeled human lymphoma cells were stained with Mouse anti BrdU antibody, clone BU20a, (MCA2483) at a 1/100 dilution overnight at 4°C. Goat anti Mouse IgG (H/L) FITC conjugated antibody (STAR117F) was used at a 1/50 dilution. READIDROP™ Propidium Iodide (1351101) was used to stain total DNA. > Visit our BrdU resources page. Mouse anti Bromodeoxyuridine antibody, clone Bu20a (MCA2483) used to label DNA synthesis in cultured mouse astrocytes by immunofluorescence. 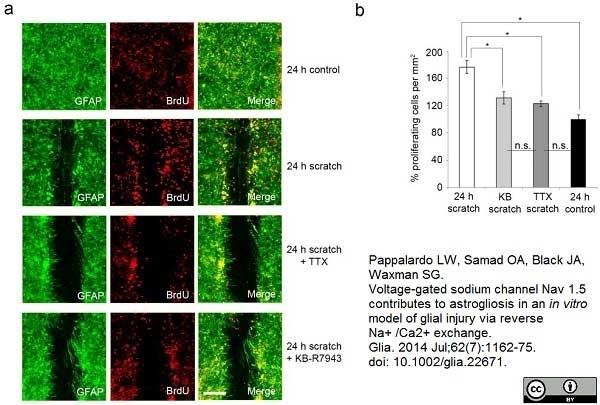 Astrocyte response to injury involves proliferation which is attenuated by TTX and KB-R7943. (a) GFAP positive cultured rat cortical astrocytes (green) exhibit BrdU immunolabelling (red), seen in resting cells (top row) and scratched cells (second row). There is an increase in BrdU-positive cells along the edge of a scratch, which is attenuated with TTX and KB-R7943 treatment (third and fourth rows, respectively). Scale bar 200 μm. (b) After 24 h, there was a significant 77 ± 9% increase in proliferation amongst cells along the edge of a wound (n=7) compared to cells in unscratched cultures (n=8), as measured by BrdU staining. Compared to untreated cells, TTX decreased proliferation by 54 ± 4%, while KB-R7943 decreased proliferation by 46 ± 9%. *p<0.05; n.s., not significant. From: Pappalardo LW, Samad OA, Black JA, Waxman SG. Voltage-gated sodium channel Nav 1.5 contributes to astrogliosis in an in vitro model of glial injury via reverse Na+ /Ca2+ exchange. Mouse anti Bromodeoxyuridine antibody, clone Bu20a (MCA2483) used for the identification of proliferating cells in the rat dentate gyrus by immunofluorescence. Ghrelin enhances spatial pattern separation and adult hippocampal neurogenesis in adult rats. (D) Representative images of DCX+ immature neurones and new adult-born DG neurones (white arrows) co-expressing NeuN+ and BrdU+ (yellow). Scale bar = 200μm. From: Kent BA, Beynon AL, Hornsby AK, Bekinschtein P, Bussey TJ, Davies JS, Saksida LM. 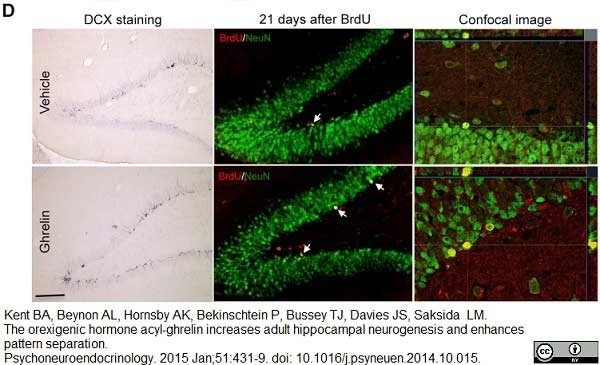 The orexigenic hormone acyl-ghrelin increases adult hippocampal neurogenesis and enhances pattern separation. Ghrelin does not significantly inhibit the rate of stem cell self-renewal in the SGZ of the DG of adult rats. Representative images identifying triple positive (BrdU+/Sox2+/S100B+) new adult-born astrocytes (arrows) and double-positive (BrdU+/Sox2+/S100B−) new adult-born stem cells (arrowheads). Statistical analysis was performed using one-way ANOVA with Bonferroni's post hoc test, n = 12 rats per group. Scale bar = 20μm. Mouse anti Bromodeoxyuridine antibody, clone Bu20a (MCA2483) used to stain dividing crypt cells in rat small intestine by immunohistochemistry on formalin fixed, paraffin embedded tissue sections. BrdU/ Bu20a/ AbD serotec/ MCA2483, Small intestine/ Rat. 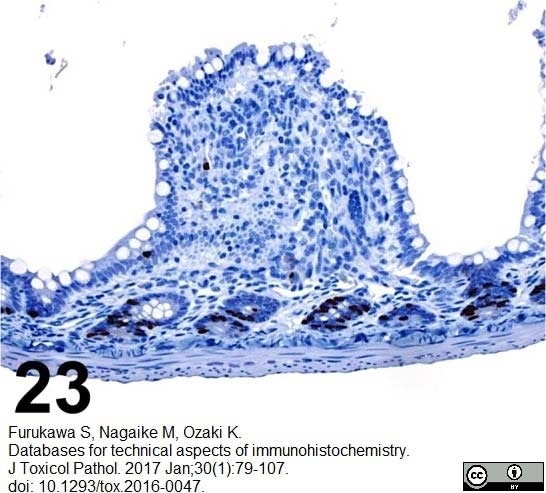 From: Furukawa S, Nagaike M, Ozaki K.
Databases for technical aspects of immunohistochemistry. J Toxicol Pathol. 2017 Jan;30(1):79-107. HeLa cells were treated with 10 μg BrdU for 1 hour (B) or left untreated (A). Cells were stained with Mouse anti BrdU antibody, clone Bu20a (MCA2483) at a dilution of 1/25. As a secondary antibody, Goat anti Mouse IgG (H/L) DyLight® 549 conjugated antibody (red) (STAR117D549GA) was used at a 1/50 dilution. Cytoplasm was stained with Rabbit anti GAPDH antibody (AHP1628) at a dilution of 1/100. As a secondary antibody, Sheep anti Rabbit IgG DyLight® 488 conjugated antibody (green) (STAR36D488GA) was used at a 1/50 dilution. PureBlu™ DAPI (1351303) was used as nuclear counterstain. HeLa cells were treated with BrdU for 3 hours and stained with Mouse anti BrdU antibody, clone Bu20a (MCA2483). Goat anti Mouse IgG (H/L) DyLight® 549 conjugated antibody (red) (STAR117D549GA) was used as the secondary antibody. Cytoplasm was stained with Rabbit anti GAPDH antibody (AHP1628). 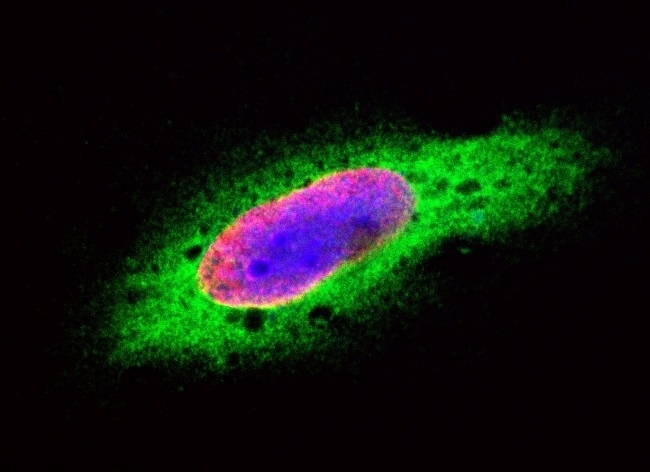 As the secondary antibody, Sheep anti Rabbit IgG DyLight® 488 conjugated antibody (green) (STAR36D488GA) was used. PureBlu™ DAPI (1351303) was used as nuclear counterstain (blue). Cross-reactivity data. A microtiter plate was coated overnight with BSA and neutravidin at 5 μg/ml. After washing and blocking with PBST + 5% BSA, biotinylated oligos (either BrdU modified, 5′-iodo-2′-deoxyuridine (IdU) modified or unmodified) were added to the neutravidin coated wells and incubated for 1 hour. After washing, Mouse anti BrdU antibody, clone Bu20a (MCA2483), was added at a concentration of 10 μg/ml. Detection was performed with HRP conjugated Sheep anti Mouse IgG (H/L) antibody (AAC10P) in HISPEC Assay Diluent (BUF049A) and QuantaBlu Fluorogenic Peroxidase Substrate. Mouse anti BrdU antibody, clone Bu20a (MCA2483) recognizes thymidine analogs BrdU and IdU but has minimal cross-reactivity to thymidine. Anti BrdU antibody, clone Bu20a recognizes bromodeoxyuridine (known as BrdU or BrdUrd). This antibody is suitable for detecting incorporated BrdU in a wide variety of cell types and is suitable for use on tissue sections in double-labeling techniques. Mouse anti BrdU antibody, clone Bu20a recognizes bromodeoxyuridine (known as BrdU or BrdUrd). BrdU is a synthetic thymidine analog, which is incorporated to new DNA during replication instead of thymidine. BrdU can therefore be used to identify newly synthesized DNA. Mouse anti BrdU antibody, clone Bu20a, recognizes BrdU and other thymidine analogs; 5′-chloro-2′-deoxyuridine (CldU), 5′-iodo-2′-deoxyuridine (IdU) and 2′-deoxy-5-ethynyluridine (EdU), but only shows minimal reactivity with thymidine itself (Aten et al. 1992, Liboska et al. 2012, Magaud et al. 1989). 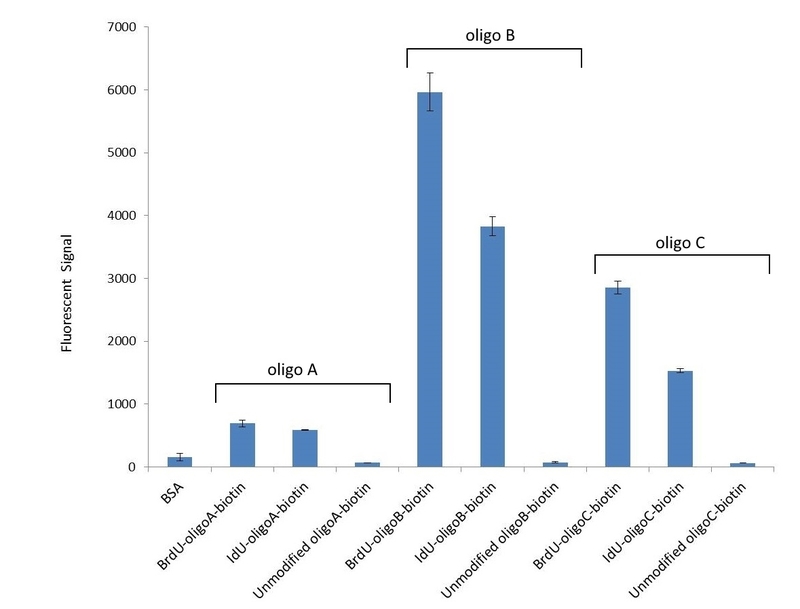 Antibody detection of incorporated BrdU in cellular DNA is extensively referenced as an accurate method to monitor cell proliferation in vivo and in vitro. In cell proliferation assays BrdU staining is coupled with the use of a dye that binds total DNA such as propidium iodide (PI). BrdU can be administered diluted in the culture medium or, in vivo via intraperitoneal injection, subcutaneous osmotic pump implants (Tesfaiqzi et al. 2004) or in drinking water (Moser et al. 2004). BrdU can be used as a thymidine analog in a wide range of organisms ranging from mammalian cells, through reptiles and amphibians to invertebrate species and plants. 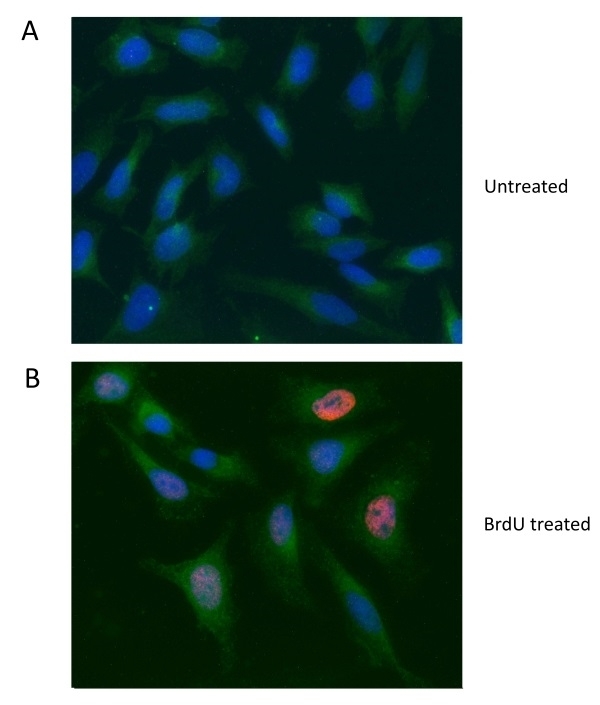 Mouse anti BrdU antibody, clone Bu20a, is suitable for detecting incorporated BrdU in a wide variety of cell types and is suitable for use on tissue sections in double-labeling techniques (Makarev and Gorivodsky 2014). Magaud, J.P. et al. (1989) Double immunocytochemical labeling of cell and tissue samples with monoclonal anti-bromodeoxyuridine. J Histochem Cytochem. 37 (10): 1517-27. Innis, S.M. et al. (2010) Perinatal lipid nutrition alters early intestinal development and programs the response to experimental colitis in young adult rats. Am J Physiol Gastrointest Liver Physiol. 299 (6): G1376-85. Caronia, G. et al. (2010) Bone morphogenetic protein signaling in the developing telencephalon controls formation of the hippocampal dentate gyrus and modifies fear-related behavior. Pappalardo, L.W. et al. (2014) Voltage-gated sodium channel Nav 1.5 contributes to astrogliosis in an in vitro model of glial injury via reverse Na+ /Ca2+ exchange. Laitman, B.M. et al. (2016) The Transcriptional Activator Krüppel-like Factor-6 Is Required for CNS Myelination. PLoS Biol. 14 (5): e1002467. Furukawa, S. et al. (2017) Databases for technical aspects of immunohistochemistry. J Toxicol Pathol. 30 (1): 79-107. Wohl, S.G. et al. (2009) Optic nerve lesion increases cell proliferation and nestin expression in the adult mouse eye in vivo. Exp Neurol. 219 (1): 175-86. Xie, L.L. et al. (2009) Aquaporin 4 knockout resists negative regulation of neural cell proliferation by cocaine in mouse hippocampus. Int J Neuropsychopharmacol. 12 (6): 843-50. Miller, C. et al. (2011) The interplay between SUCLA2, SUCLG2, and mitochondrial DNA depletion. Biochim Biophys Acta. 1812 (5): 625-9. Sato, Y. et al. (2013) Grafting of neural stem and progenitor cells to the hippocampus of young, irradiated mice causes gliosis and disrupts the granule cell layer. Cell Death Dis. 4: e591. Kent BA et al. 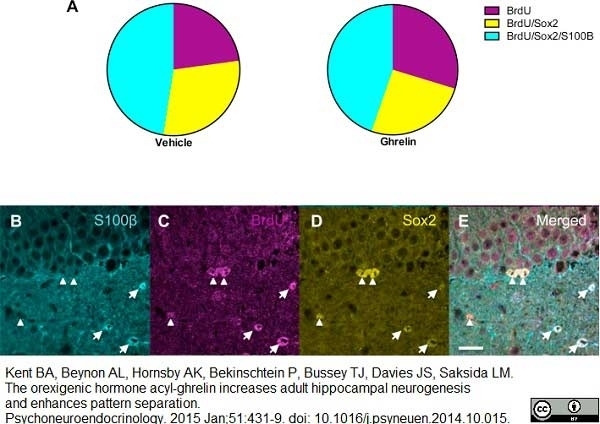 (2015) The orexigenic hormone acyl-ghrelin increases adult hippocampal neurogenesis and enhances pattern separation. Li, Q. et al. (2017) Induced neural activity promotes an oligodendroglia regenerative response in the injured spinal cord and improves motor function after spinal cord injury. Kim, H.N. et al. (2017) Comparative analysis of the beneficial effects of treadmill training and electroacupuncture in a rat model of neonatal hypoxia-ischemia. Int J Mol Med. 39 (6): 1393-402. Neurobiology of Aging. Oct 10 [Epub ahead of print]. Mini-review: “Understanding the Eukaryotic Cell Cycle A Biological and Experimental Overview"